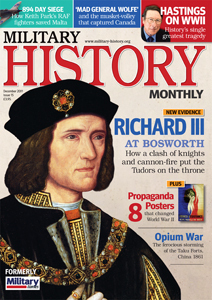 The December 2011 issue of Military History Monthly, the British Military History magazine, is on sale today. Bosworth – What really happened? Battlefield archaeology has transformed our understanding of how King Richard III lost his throne. Military History Monthly assesses the evidence and attempts to reconstruct what actually happened. We discover a bizarre clash between cannon and heavily armoured knights – a battle symbolic of the transition from the medieval to the modern world. In this instalment of our series on the British Army, we examine James Wolfe’s victory at Quebec, the victory of an army forced to adapt fast to the demands of colonial warfare in the wilderness. Air Vice-Marshal Keith Park was the strategist behind the Battle of Britain. Military historian Dave Sloggett tells the story of the tactical master-mind’s central role in the aerial defence of an island under siege. Military History Monthly talks to Max Hastings about the thinking behind his new book and his personal engagement with the subject of the Second World War. Jules Stewart, author of a new biography of Prince Albert, argues that his role was crucial in creating a national force fit for purpose.